Registering a domain name is the very first step in creating a new website. It is your home address on the Internet. By registering a domain name, you have the sole right to the use of this name. 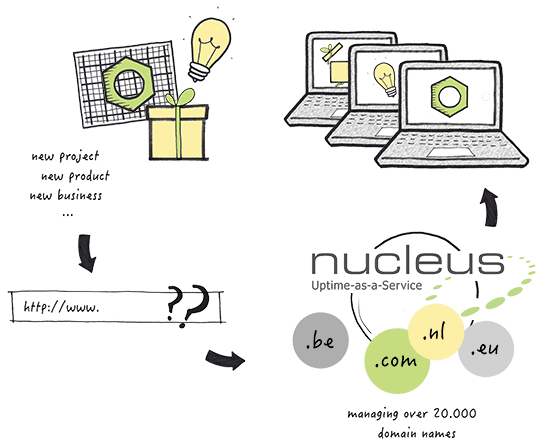 Nucleus manages over 20.000 domain names. This experience means that we are able to offer an attractive package of benefits. Whether you are a beginner or a seasoned web-builder. Are you working on a new project, business or product? If you are, register the domain names you want to use as quickly as possible. This domain name can be a .be name or have one of the other possible extensions, such as .nl, .eu or .com. We aim to provide the best value for money for our registration service. We want to provide you with the services that make your life easy – at an extremely competitive price. The actual cost is defined by the extension you want to register. Thinking big? Become a partner! It’s not just one but 50 domain names that you want to register? Or maybe you manage your customers’ domain names? Think about becoming a Nucleus Partner then. That way you can register and manage domain names faster, easier and cheaper.